My mom is usually the first person I turn to for crafty advice and know how. We love doing creative things together and bounce ideas off of each other. I really look forward to our visits (which aren’t always that frequent as she lives millions of miles away on another continent). When we do see each other though, we usually make things together and plan endless creative days (usually next years’ Christmas presents) and catch up on missed time. Luckily the internet and the modern mobile phone phenomenon does help with the distance situation- I’m forever sending off photos to her of current WIP’s ‘Which do you think is better?’ And she’s usually got some pretty fantastic ideas and wonderful suggestions. Tweaking on projects can take days and several Mom consults. The *Coin Purse is no exception. The coin purse was originally an idea from my mom of something we could make on our visit last year. My mom tried her best with an order for a coin purse craft kit but unfortunately the supplier was rather awkward and uncommitted on delivery (or customer service for that matter) and so we put it off until I see her again next year. However, seeing the purses pop up again on Pinterest I’ve been eager and a little desperate to have a go. And so here we are again – miles apart, running through ideas over Whatsapp. BUT… persevere fellow crafter as after the trauma of successfully sewing on the clip, you then get to the REAL FUN bit!! FUN, Embellishment and decoration and all things pretty and colourful. Staple MUSTs for any MadeByNina thing. I’ve made two purses so far… Pretty Christmas gifts don’t you think? How about you? How are your Christmas preparations going? Oh – I forgot to say… there will be purses on my Etsy Shop sometime soon. I’m so pleased with the outcome of May’s Daisy blanket. I’m so excited and cannot wait for Christmas! (as most of you will know this is not unusual for me… but I’m even more so now!). I love giving gifts especially handmade gifts… it’s the most exciting part of Christmas for me. Seeing the recipients’ faces when they open a parcel and find that the gift was made especially for them. I’ve never had a bad reaction to my gifts (well not that I know of – feel free to correct me) and I just love the fuzzy ‘proud of me’ feeling it generates… go on… you should have a go and make something for someone special this Christmas too. At 90 years old, May spends a lot of her day watching sport and other favourite shows on the TV and I’m fairly certain this blanket will be a warm and welcome companion on her lap. I used Caron Simply Soft yarn in colours Sunshine, White, Soft Green, Robins Egg and Soft Blue. I had wanted to use an off white (as Tillie Tulip used) which looked a bit like a soft grey or a silver, but the off white yarn I received looked more yellow than silver and so I used a soft blue instead. Talking about Daisy’s – I’ve made another pair of Wrist Warmers and have embellished them with tiny little crocheted daisies. 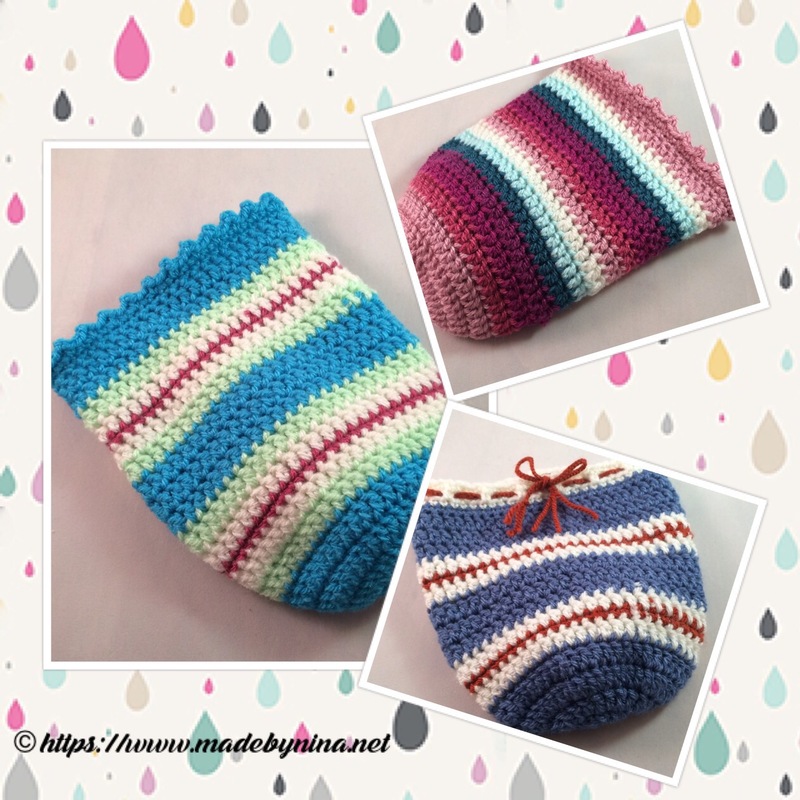 I think these will make perfect gift for someone like me – who loves all things colourful… Find these here, on my Etsy Shop. I came across the beautiful Tillie Tulip blankets whilst looking for something to occupy myself with while I wait for the arrival of the stuffing to finish Mauroon. The pretty floral blanket gave me an idea for a Christmas gift for my MIL. (May is amazing at 90 years old but I am quite sure she will not see this post, if you do – please do not mention it to her either). An artist and gardener alike I feel she will love the colours and hope she will enjoy the warm gift. I have really enjoyed making the squares so far! 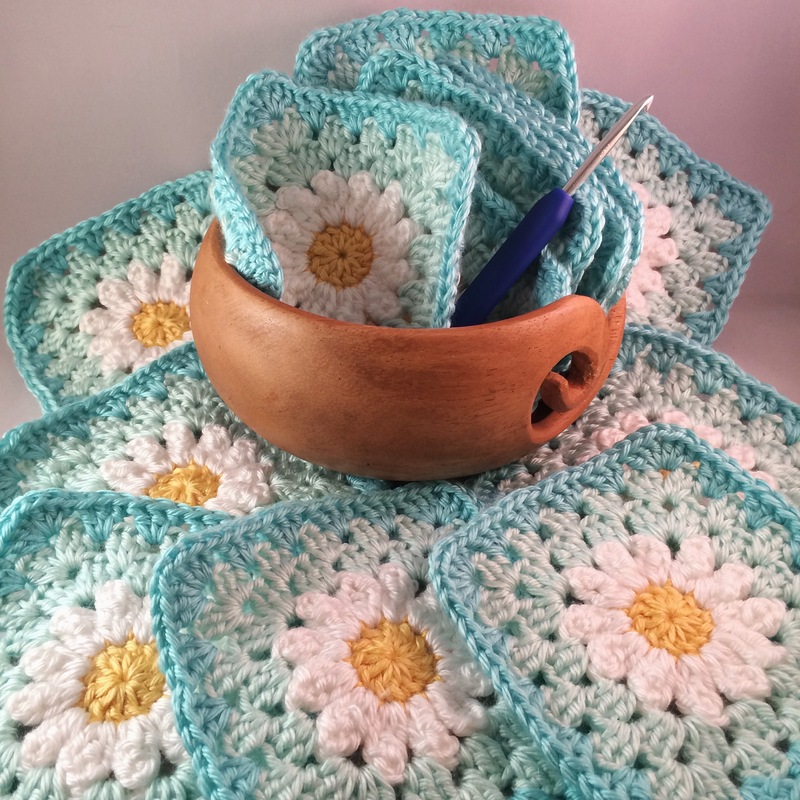 If you’d like to make your own, find the tutorial for the Daisy here, and the additional rounds here. I’m using a 4.5mm hook with Caron Simply Soft, colours Sunshine, White, Soft Green, Robins Egg. I will update you once the blanket is completed.